May, 2014 | Live Music in Athens Georgia! Sorry this is late. This will be a quickie. You may have noticed my ExFM player on my web site no longer works. They turned it off on May 16th but I haven’t the time yet to search for a replacement player. Any suggestions are greatly appreciated. I am slammed with outdoor work, working on the recording backlog, helping take viruses out of several people’s computers, etc. The three day Mem. day party also contributed to the backlog, but it was a fantastic party! The Purple Hatters Ball was fantastic with Dubconscious, Beats Antique, The Heavy Pets, New Mastersounds, etc. I’ll be working on that next, I still have Randell Branblett’s show from last week to do first. They just announced Blackwater festival at Suwannee Music Park for this Aug. http://www.blackwatermusicfestival.com/ Early ticket price goes up on 6/14. The Revivalists (one of my favorites) and Fishbone justify the ticket, the rest is gravy. BLUE BLOOD Melodic psych-pop project from Hunter Morris, formerly of Gift Horse. THAYER SARRANO AND THE LIVING Local songwriter playing hazy, desolate, Southern-inspired rock tunes. POCKETFUL OF CLAPTONITE Experimental jazz ensemble led by Killick Hinds. THE MOON Brooklyn, NY-based experimental free-jazz/psychedelic duo of guitarist Adam Caine and drummer Federico Ughi. CLASSIC CITY ALLSTARS No info available. Georgia Theatre Rooftop On the Rooftop. 6 p.m. FREE! THE SHOAL CREEK STRANGLERS Local roots-folk duo featuring members of The Humms. PIPES YOU SEE, PIPES YOU DON’TPete Erchick (Olivia Tremor Control) plays gorgeous psych-pop. LITTLE GOLD Local group fronted by Christian DeRoeck, formerly of Woods, playing garage rock with country and pop sensibilities. STATE CHAMPION Rock and roll band from Louisville, KY. The Melting Point Athens Area Habitat Benefit. 8:30 p.m. $5. MANMADE MOUNTAINS Local modern-folk crew drawing inspiration from groups like The Avett Brothers. SILVER EAGLE MINING CO. New local female-fronted rock and roll band. THE JESTERS Formed in 1964, this will be the final performance for the classic soul and blues band. LITHUANIA New garage-rock duo featuring members of DRGN KING and Dr. Dog. MEA CULPA Post-punk outfit from New Orleans. ANCHOR BENDS Hi-fi Americana rock from ATL featuring ex-members of Leatherface. THE SALT FLATS Original guitar-driven blues-rock. Bootleggers Country & Western Bar 9 p.m.
ISAAC BRAMBLETT BAND Former Debris frontman and son of Randall Bramblett plays real Southern soul with a lethal jam-band featuring Derek Warren on bass, Dwayne Holloway on drums, Daniel Bell on guitar and newest member Carter Herring on guitar. PADRE Local indie band featuring members of Dana Swimmer and Mothers. LITTLE KINGS 10 YEAR ANNIVERSARY SHOW The club celebrates a decade of stiff drinks and hot tunes with music from DJs The King and MC Cord, Dave Marr, Daniel Aaron, Ruby the Rabbitfoot, The Darnell Boys, Exotic Functions, Skin Colour, Eureka California, Cancers, Incendiaries and DJ Easy Rider. DON CHAMBERS Local singer-songwriter who has taken an experimental turn of late. A MURDER OF ONE Dark Americana outfit from Fort Lauderdale, FL. THE HONEY SLIDERS Original music from Catropolis featuring Rocket Gizmo’s, Toy Soldiers Coming to Life and Gomez The Multi-Colored Snake. Georgia Theatre Americana Mondays. On the Rooftop. 8 p.m. FREE! YOUNG AMERICA Local alt-country band. DREW KOHL Original singer/songwriter who plays bluegrass-inspired folk music. TUESDAY NIGHT CONFESSIONAL Host Fester Hagood presents this week’s showcase of singer-songwriter talent, featuring Beauty & the Beard, Scott Rainwater, Doyle Willams and Lamar Williams Jr. and Neil Donnell Ray. No promises about my schedule.There are a lot of shows I want to go to but finding time is problematic. I will try for Pocketful of Claptonite tonight. Kenosha Kid on Thurs. Fri I’m not sure, Claire Campbell and the Salt Flats are my best bets. Sat is a pig roast so I won’t be in town then. Big C’s Blues night Mon is my best bet of the week that I’ll be there. I’ll also try for 90 Acre Farm on Tues. Thank you so much to everyone who helped with the 36th AHRF. Man, what a fantastic weekend! Great weather, great speakers, great music and a great vibe. It really hit me walking up the closed off street Sun afternoon, what a wonderful thing a handful of dedicated people can accomplish. I hope y’all enjoyed it. I also hope y’all took my warning to heart, the T-shirts were almost sold out on Sat and I think we only had two adult size small and a few children’s shirts left on Sun. While the formal AHRF committee goes into hibernation until the first of next year, I will be trying to put together a couple of fundraisers (I hardly get any sleep anyway). Anyone interested in helping put together something like Jay Rodger’s Birthday Bash and AHRF fundraiser or any other ideas, please contact me. 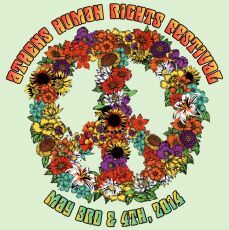 Let’s keep Athens in the record books for having the longest Human Rights Festival in the country. 37 is my lucky number! I’m sorry I didn’t get a chance to send out my email last week, I was a little busy. I started at 5 pm Fri helping close the street and building the stage until 2 am Sat. Back Sat at 11:30 am hugging, dancing, partying, listening and recording for 12 hours. Back again Sun doing it all over again from 2 pm until after 10 pm and then taking down and packing up the stage until around 3 am Mon morning. I then started packing Mon for the Purple Hatter’s Ball and left Tues morning for FL. There was a fish fry waiting on me when I arrived Tues evening. I spent the day at the beach Wed. Around 3:00 on Thurs I was working in the garden with my friend Lynn when she asked me if I had checked to see if they added an extra day to the Purple Hatter’s Ball. I hadn’t cheeked of course so it was a surprise to find out the music started in 4 hours. I hit the shower, packed and drove 100 miles to get there. I then spent the next 4 days hugging, dancing, partying, listening and recording. It was great seeing Athens represented on stage with Dubconscious and Carl Lindberg also sat in with Rising Appalachia.I got home yesterday and have been working with my plants. I was starting to worry about withdrawals as I don’t have another festival scheduled until Lockn’ in Sept. I then started this email and found I have the Marigold Festival this Sat. Athfest is next month and also Riverbend in Chattanooga so I think I’ll survive. There are a lot of new bands popping up all over Athens. I’m not going to have time to check them out for awhile so if you hear any outstanding ones, please let me know. Georgia Theatre On the Rooftop. 6 p.m. FREE! The Melting Point 7 p.m. $5 (adv. ), $7 (door). MARY SIGALAS QUARTET Visiting jazz standards and not-so-standards from the ’20s through the ’50s. SLOW PARADE No info available. MICHAEL BOWMAN Local alt-country/blues singer-songwriter, originally from Harrisonburg, VA.
AMIGO South Carolina-based Americana outfit. SAM SNIPER Local alt-country band playing grunge-influenced, energetic and heartfelt tunes. JINX REMOVER Formerly known as Close Talker, this local band plays driving, melodic indie rock. BOYCYCLE Local folk-pop band, featuring the beautiful clash of acoustics and synths and starring the confident vocals of Ashley Floyd. DAVE DESMELICK Local Americana singer-songwriter. GROGUS This long-running local ensemble plays jazz and salsa accentuated with reggae, hip hop and Afro-Cuban styles. WINTERVILLE MARIGOLD FESTIVAL Featuring an all-day lineup of music, including Red Oak Southern String Band, Jim White, Betsy Franck, The Welfare Liners, Shonna Tucker & Eye Candy, Scott Low and the Southern Bouillon, March and Abbey Road Live. CANDID COAL PEOPLE Local foot-stomping dance-folk group. JAZZ FUNK JAM WITH DREW HART Local musician and Juice Box bassist leads a jam session. ADAM KLEIN & THE WILD FIRES Local songwriter playing a rustic blend of country, folk and Americana. JOHN MORELAND Singer-songwriter from Oklahoma. SAILORS AND SHIP Local singer-songwriter Jeremy Wheatley (Crooked Fingers, Ruby the RabbitFoot) plays a set of stripped-down folk tunes. MRJORDANMRTONKS Collaboration between longtime Athens musicians Tommy Jordan and William Tonks, featuring rootsy guitar picking and paired vocal melodies. ANNE RICHMOND BOSTON The frontwoman of seminal new wave outfit The Swimming Pool Q’s performs a solo set. TUESDAY NIGHT CONFESSIONAL Host Fester Hagood presents this week’s showcase of singer-songwriter talent, featuring Alexis Vear and Stephen “Blues Dude” Duncan. I have such a backlog of music I only plan on coming to town for the Marigold Festival and I may try for the end of Grogus on Sat. St and follow your eyes and ears, can’t miss us! highly appropriate for these times. Please join us tonight for the cleansing ritual around 6:00 followed by the building of the stage.. If you would like to help build the stage just find me and let me know. We can always use extra hands to set up barricades, tables, etc. I hope to see y’all downtown and preferably multiple times between tonight and Monday morning..